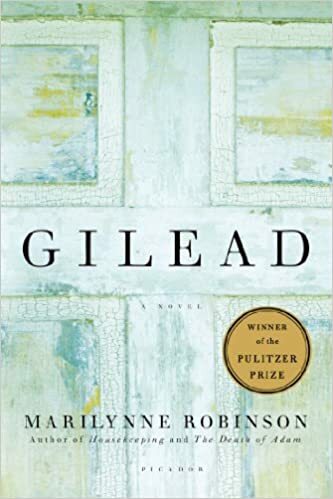 I’d heard friends talk about Gilead for several years. I’d seen it was a best seller, and heard authors quote it. It must be good, so I picked it up. Read through the first page or two. Nothing happened. I put it down. A couple months later, picked it up again. Nothing happened again. Blah. I resigned myself to missing out on what everyone else was enjoying in the book. Then one recent Saturday morning, my brother-in-law mentioned it in a family email. He said Gilead resets a person like a good night of sleep, and he wanted to discuss it with someone. I decided valiantly to try the book again, trotted up to the library, brought it home, and was absolutely taken in, like a fuzzy blanket wraps you up and you can’t untangle yourself. Maybe it was the air, the leisure I was feeling, or the invitation to discuss. Probably it was mostly that I was mellow enough to absorb the words that had no great action, no shimmering plot line to pull me forward. It was the slow, steady beat of an aged man’s heart dribbling out of his pen to write messages to his young son, and he wrote so beautifully and lovingly that I read half the book that first day. A dying pastor is writing to his young son, not yet seven. Seeing life and people and love through those old, gentle, wizened lenses felt sacred and sweet, like I couldn’t get enough sweetness. It’s sweet but not cloying. Insightful, but not ponderous or stuffy. Full of love and longing but not sentimental or fluffy. I’m glad it’s not just pastors who can bless when they pronounce the benediction. All of us can bless each other, and when we say simple words like “Bless you” (not for sneezes, but for big assignments and partings and dilemmas) we acknowledge and affirm the sacredness of that person and that moment, which is an enormous gesture to receive from anyone, a privilege to pronounce on someone, and something to practice generously. What if we sprinkled blessings around like confetti? The next lines need no commentary, only long pauses to think about the lines for several days. If you read the book, let me know what you think! Can’t totally explain why, but I cried at the end of this book. So piercingly bittersweet. Home and Lila, other books with the same setting, are worth the while too. Thanks for stopping by here, Eugene. You describe the book well, and make me want to read the others. Oh, wow. Now I want to read it too! Those pieces sound like morsels you could savor for days. How could the man be old and have a seven-year-old son? Thanks for the review! I’m always on the alert for a good book. Rosina, maybe that question is part of what takes the reader in, instead of a shining plot line. I’d love to hear what you think!